Tesla Model S Sedan Concept: First Official Pictures! Digg co-founder Kevin Rose has accidentally broken the embargo on the Tesla Model S Sedan concept set to be revealed in Los Angeles in mere hours on his flickr account. Developing! 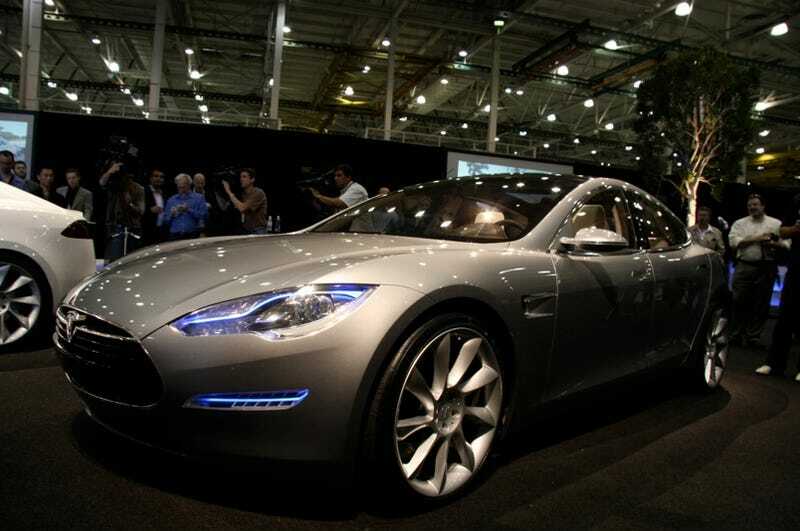 UPDATE: We now have all the details and a slew of live shots of the Tesla Model S concept. Read the full story here! What these first shots reveal is a rear 3/4 shot of the new concept, a side look and an interior filled to the brim with wires, looking like it's still being put together. Makes sense, as it appears the shots were taken three days ago, probably as they were still putting together this hand-built concept. Other than those details, we guess we'll just have to wait a few more hours to find out more information — like, for instance, what car platform they're planning to build it off of. Because here's the problem. If Tesla claim they've built their own chassis, then this car is vaporware. Because in order to get a new chassis on the road, they'll need much more capital than what they've already asked for to do the necessary safety testing and durability testing. So it has to be another automaker's chassis. But which one? Even without details there's a lot we can learn from these pictures. For starters, Tesla already has a deal worked out with Mercedes for providing electric drives for a small batch of Smart cars. Assuming they continue that relationship with Mercedes, and given the wheels, for instance, appear to be a version of this Lorinser wheel and seems to carry the 5-112 bolt pattern, means if it's a Mercedes, it's likely based on a Mercedes C, E, or CLS chassis. If those are 20-inch wheels it's unlikely it's a C-class platform and more likely to be E-series or CLS-based. Of course this is just our stretch-of-a-guess, no matter how educated they may be. We really will have to wait until later today to find out for sure how Tesla built this concept. Also, that's one seriously sweet full-screen dashboard. UPDATE: For some odd reason, Tesla's asked Kevin Rose to pull his pictures down off Flickr. We echo Kevin's comment of "not sure if the company knows how the 'ol web works."